Add the Food Delivery feature to allow your customers to conveniently order your food directly through your app. Connect with an online delivery service, or use Deliveries by Swiftic—no outside delivery service needed and at no extra cost to you! Increase sales by offering customers a fast way to order deliveries on the go. Offer customers choices they can't refuse by showing your tempting menu right in the app. Grow loyal customers! The more they order from your app, the more they'll think of you first. 1. Add this feature to your app, along with your delivery menu. 2. 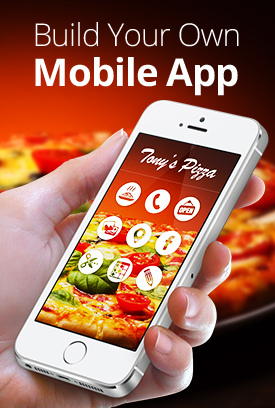 Customers use your app to see your menu, order food and pay. 3. You and your customers receive emails with the order details. Free yourself from the hassle and costs of using an outside food ordering service—no setup fees, no monthly fees and no percentages of your delivery! In the All Features category tab, select the Food Delivery feature. Select a food delivery service (Deliveries by Swiftic or an online delivery service) and click Add. Enter the menu URL, and click ✓. Under the Business Info tab: enter your email address, phone number and business address. Note: The email address will be used to send you the food delivery order and is only visible to us. The phone number is for your customers to reach you if they have any questions. Enter your delivery area and delivery hours. If you'd like to give your customers the option to pick up their order, check Allow pickup from store. Enter your email address (so we can send you the order). If you'd like to also get the order through text message (SMS), enter a phone number for receiving the text message. Then click Save and Continue. Under the Payment System tab, select which payment methods you'd like to use. You can choose more than one. STRIPE: To accept credit card payments, click Connect to Stripe. Note: Stripe is a tool that allows your customers to pay for delivery orders directly through you app. You can set up your Stripe account in the next step by filling out the form. Learn more about Stripe pricing. Important: Stripe is only available for businesses in these countries. PAYPAL: To accept PayPal payments, click Connect to PayPal. CASH: To accept cash payments, click to enable. If you selected Stripe, fill out the Stripe form and click Authorize access to this account. Select your restaurant currency, and enter the minimum order amount, delivery fee, and tax rate. Then click Save and Continue. Note: If your customer doesn't reach your minimum order amount, they'll be notified and won't be able to place the order until they reach this amount. Click the Delivery Menu tab and create your delivery menu. After you finish building your menu, click Back to App Editor. a) Click (+) in the Background section. b) Click (+) and browse to the compatible images for smartphones (640px X 960px) and tablets (2048px X 1536px) respectively, and click Open.